Samsung uses Stanley Kubrick’s 1968 science fiction film as evidence against Apple’s intellectual property infringement lawsuit. In the fight against knockoffs, in July Apple filed motion for preliminary injunction against Samsung phones and tablet in California courts. ObamaPacman: Samsung claims that the movie prop is a personal tablet computer. How does that stack up to reality? The prop has keys from 0 to 9 but no one touched any key. Instead, the prop acted similar to a TV. There was zero user interaction or “personal” control of the device, which displayed only a BBC TV broadcast. If a tablet computer can reduce the need for paper and bring real time information everywhere, why would you use paper clipboard instead of a tablet computer? At other places in the movie, characters use physical buttons to control computers. 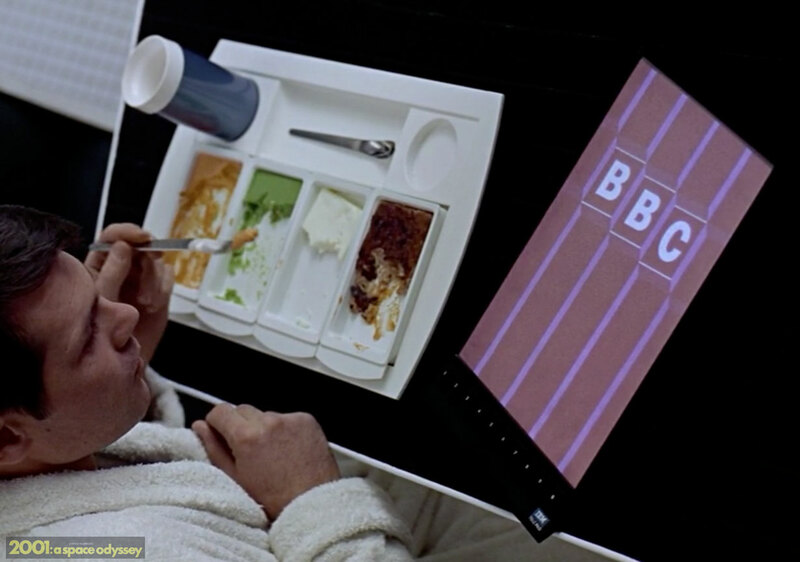 No mouse (which Apple popularized year later), and the movie does not show interaction with “tablet”. More interaction with hardware button. Still no tablet with a touch screen! And finally, how cheap is Samsung? The blu-ray disk for 2001: A Space Odyssey is only [$12.49 on Amazon ] and the lawyers only submitted a low-resolution screenshot of YouTube video as evidence? Obviously, the Korean based Samsung did not want to pay even the meager twelve dollars to a US movie company to help its legal defense. Unfortunately, if Samsung did spend a few dollars to buy a high quality version, they would have known that the movie prop is of a different design than the Apple iPad. Bezel size: The movie prop bezel is much thinner than the Apple tablet. In contrast, the iPad’s thicker bezel design provides enough room to hold the Apple tablet without triggering touch display. In addition to protruding number keys, side view shows angled lip on the bottom. That surely makes the device flat. (Maybe in Samsung’s silly world). Well, maybe Samsung’s silly science fiction excuse for making knockoffs of Apple’s market leading tablet will fool fandroids. But unlike Android fans, the judge isn’t gullible. In reality, is it more likely that Apple reversed engineered a movie prop with no working parts (which doesn’t even look like the iPad) to create the iPad, or that Samsung reversed engineered the market leading Apple tablet? This entry was posted on Wednesday, August 24th, 2011 at 3:51 pm	and is filed under Samsung, iPad. You can follow any responses to this entry through the RSS 2.0 feed. OP also has some great new graphics on the topic, coming today or tomorrow. Wrong. Samsung is fighting a design patent. A design patent only protects the ornamental look of an object. Any use or non-use of that object is not relevant to a design patent. So the fact that none of the actors interacted with the devices matters not one bit as to whether it shows the “look” of a tablet device. As the author illustrated, the video playing object does NOT have the ‘look’ of any iPad, or Samsung rip-off there of. (Your other points are well taken as ‘not relevant’). I’m not sure Samsung’s lawyers could have better expressed their desperation. Their new courtroom absurdity belongs in ‘Believe It Or Not’. I can’t imagine the court is amused or impressed. (BTW OP Editor: Please get a vector illustration app. Your freehand drawing is as good as mine, which is to say that it’s awful). The purpose of a design patent is to prevent the situation where one product so closely resembles a patent-protected object that an “ordinary observer” might mistakenly purchase it, thinking that it was the patented item. So this is where the use or non-use of the items come into play. If obvious differences in functionality/application demonstrate that an “ordinary observer” would not confuse the items, there can be no infringement. Therefore, It would seem that prior art related to a television would have little or no bearing on a tablet computer if the “ordinary observer” is able to tell from apparent use that one is a television and the other is not. In this case, the video makes it quite clear that we’re dealing with a television. The three black and white line drawings marked ‘D677 Patent, ‘D790 Patent, ‘D016 Patent, those drawings are what the patents cover. So whether the ‘2001 pad looks or does not look like an ipad is irrelevant. It is whether the ‘2001 pad looks similar enough to these line drawings to invalidate the patent. And in that case, there is a very high likelihood that the look is similar enough to knock out the patents. “if, in the eye of the ordinary observer, giving such attention as a purchaser usually gives, two designs are substantially the same, if the resemblance is such as to deceive such an observer, inducing him to purchase one supposing it to be the other, the first one patented is infringed by the other.” (Gorham Co. v. White, 81 U.S. 511, 528 (1871)) (From http://www.applepatent.com/2011/04/apple-v-samsung-design-patents-egyptian.html). Fully observation based. No “is it used the same”. One could be an ipad with touch interface, the other could be a 0.5″ thick television with no touch interface, if the “resemblance” is close enough, then they overlap. Manner of use has zero effect in design patents. And what do you suppose “giving such attention as a purchaser usually gives” really means if not noticing whether you’re buying a TV or a tablet computer when in the market for a television? The use of the item is what would make the distinction clear to an “ordinary” person who is “giving such attention as a purchaser usually gives.” A purchaser usually says, I’m looking for a TV, and then consciously eliminates those items that are not TV’s. If that’s not considered “giving such attention as a purchaser usually gives,” I do not know what is! Furthermore, based on functionality and use a TV is likely to be grouped with the stock that’s identified as TV’s, while computers are grouped with computers. This is the sort of thing that an “ordinary observer” tends to notice when purchasing under usual conditions. Often, the apparent utility of an object is enough to ensure that an ordinary person observing under usual conditions as a purchaser will not be deceived. So how can it be eliminated as possibly being a part of the determination? Often the design itself lends functional clues. If the implied function removes the possibility of deception/confusion, then apparently recognizing the use or non-use of a product can play a part. I’ll compete for the most awful freehand drawing contest. When’s the match? You do realize the device shown in this science fiction movie looks nothing like the iPhone design patent? Exactly. Trade dress is typically classified by product industry. In other words Samsung is: Desperate! Thanks, got a lot to work on here before catching up to Xkcd. Apple’s patents are about the forest, not the trees. Samsung has shown other forests existed before the orchard was planted. These actions show that the fruit is going bad. Wow. Maybe Samsung’s crooked copycat forest made some people blind? There’s a great deal of ‘whoosh’ about all these “arguments”. Did anyone actually go back and read what Arthur Clarke wrote about these things?